The Magazine Sleeve is a simple yet extremely effective method of providing a better grip on smaller framed handguns. The Magazine Sleeve is a simple yet extremely effective method of providing a better grip on smaller framed handguns. It simply slides over the top of a longer magazine and fills in the gap where the magazine sticks out of the frame. XGRIP is made of an elasticized polymer, which means that it is soft to the touch. It feels great in your hands. It's definitely different from the original Magazine Sleeve, item #2046, in the way it feels, but the concept is the same. 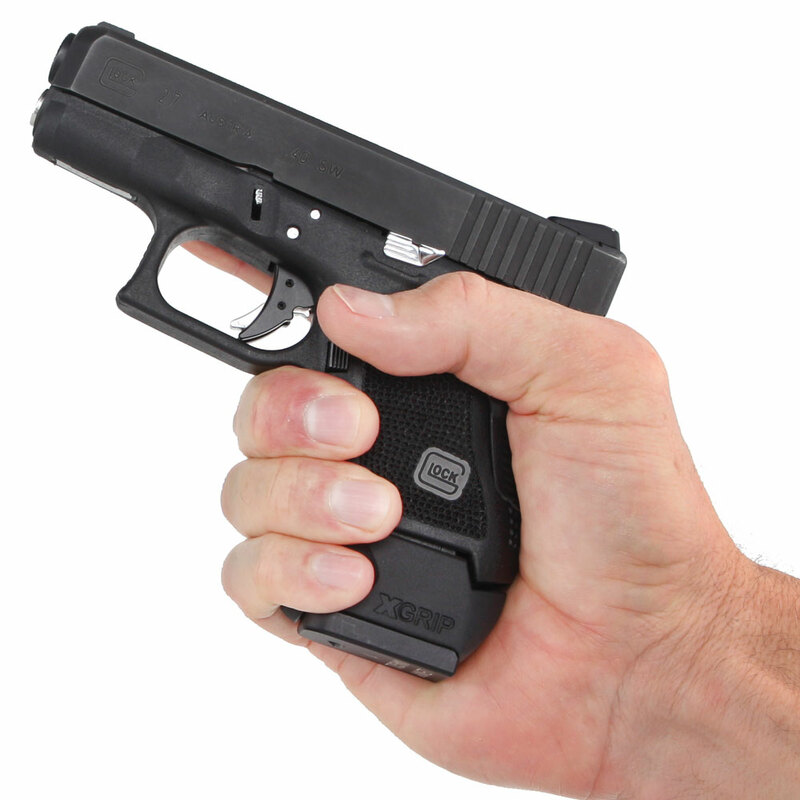 Just purchased the "X-Grip" for my Glock 26.It turns a subcompact grip into a full sized grip...!! I placed the sleeve over a G 34 or G17 magazine.The G-26 now holds 17 rounds instead of the 10 round magazine. ......You gotta love that.....!!!! I just received my x-grips today. Just like Lenny said, they really improve the feel of a 21 mag in my 30s. I watched the video and thought I'll give it a try. It not only feels better in your hand, it looks like it belongs on the handle. If your on the fence about getting some for you sub, believe me they are well worth it. Thanks Lenny and everyone at The GlockStore! I recently purchased several X-Grips to enable me to utilize G17 and G19 magazines in my G26. Since my G26 is a Gen 4 model, both X-Grips for the G17 and G19 magazines had a small space visible between the top of the X-Grip and the bottom of my G26 near the magazine well. I purchased a #17 O ring at Menards and slid it on to the bottom of my G17 magazine and did the same with a #33 O ring for my G19 magazine; I then slid the X-Grips on each magazine and reinserted them into my G26. This minor adjustment took care of the small gap that was previously visible when I used the X-Grips with my G17 and G19 magazines and greatly improved the overall fit and finish and also helped to eliminate the "wobble" typically felt when G17 and G19 magazines are inserted into a G26. Now I can have 15+1 or 17+1 rounds available in my G26 when I need the extra firepower and the feel, fit, and finish of the X-Grips are excellent! Just ordered my G19 to G26 X-Grip. Very excited to put it to use! I keep my service 19 at work and carry the 26 off duty. I will now be able to carry my 26 with a better grip and higher capacity mag (15 rd rather than 10 rd), all while keeping the sub-compact frame. Perfect product! If you want to use a 13-round G21 mag in your G30 AND have it fit correctly, look no further. I just received mine, installed it on one of my G21 mags and it fits perfectly! The X-grip is the best $13.00 I have spent on my G26. The grip adapts a G17 mag to extend the pistol grip of a G26. My first three shots were more accurate than the last 100 rounds. Much easier to control muzzle flip. Feels great in my big hands. These grips look great and function even better. If you need a X-Grip for your Glock 39, get the 26-27C. Fits perfect on a G38 Mag and looks like a factory fit on in place on the Glock 39. Best add on item in my mind. I purchased one for every G17, 17 round mag I own for my Glock 19, what better control. Highly recommend it, my accuracy is great, it's amazing what getting a great grip means to accuracy. Would love to find a large mag and grip for the G43, mostly for range shooting, I spend too much time reloading. Purchased this product, along with G19 15rd mag. Have a match grade G19 threaded 2xDiamond barrel. Put them, with a few other simple upgrades together and have a great G26 with all the perks of a G19. My build, my nirvana. Bought a factory glock 17, 17 round magazine for my glock 19 and the X-Grip. The gun feels better in my hand, easier to hold on to. I have more control and my pattern is nice a tight. Super fast shipping, Glockstore has my business for life. Thanks Lenny! I have a Glock 17 and a Glock 26. I use the X-Grip on my 17 round mags for the G26, and the gun looks much more finished and now I have more rounds in the smaller gun. I definitely recommend this over adding one of the other mag grip extensions to the stock 10 round mag because those are always angled and left the back of my palm open. With this I have a more solid feel on the gun. I also got the G19 to G26 version X-Grip for the 15 round mag in my G26 for an even smaller option, it also feels great. FYI, These won’t work on the Gen 5 mags. I purchased two of these to utilize the magazines of my G22 w my G27, love the look and the feel. I want to thank the gentleman that suggested using an O-ring on the magazine to reduce the minor gap between the XGrip and the handle, awesome fit and feel. Would highly recommend. I wasn’t impressed w the way GlockStore handled my order due to one item being backorderded until I reached Jay T. via chat who corrected and handled my problem. He’s a real asset to this company.